We’ve talked many times about how the world desperately needs another production truck to compete with the offroad juggernaut known as the Ford Raptor. Nissan teased a concept called The Warrior back in January that looked like it might potentially be something worthy, but here we are 9 months later and we haven’t seen anything more about it. Then, of course, there was my personal favorite from GMC called the All Terrain Concept that was released back in 2011, but unfortunately, it remained in concept form and was never built. 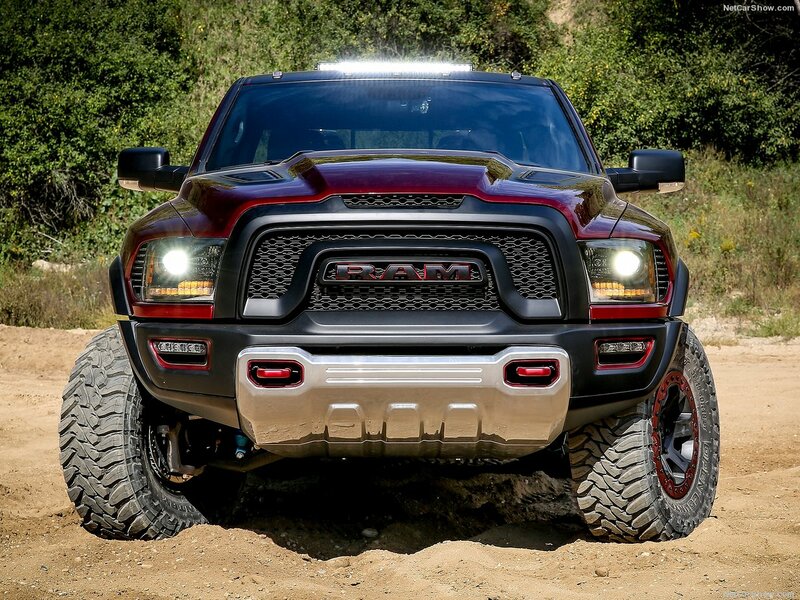 RAM Trucks or Dodge Trucks as most people still refer to them, released the RAM Rebel last year and sort of implied that it was going to be more suited for offroad use than a regular RAM 1500, but not a direct competitor to the Raptor. This was somewhat of a disappointment, to be honest. But turns out those mad geniuses at RAM had a few tricks up their sleeve apparently because they have just released the RAM Rebel TRX concept, and it looks magical. 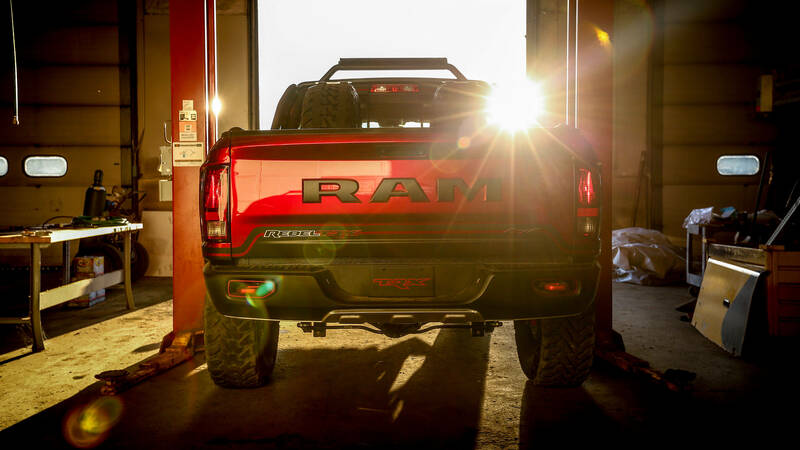 Love, at first sight, is really the only way we can describe this badass truck, and the more we learn about it, the stronger that love becomes. Now before we go any further we should point out this is still classified as a concept, and as we learned with the GMC All Terrain there are no guarantees it will be built. Now that we got that out of the way, here’s what we know as of now. 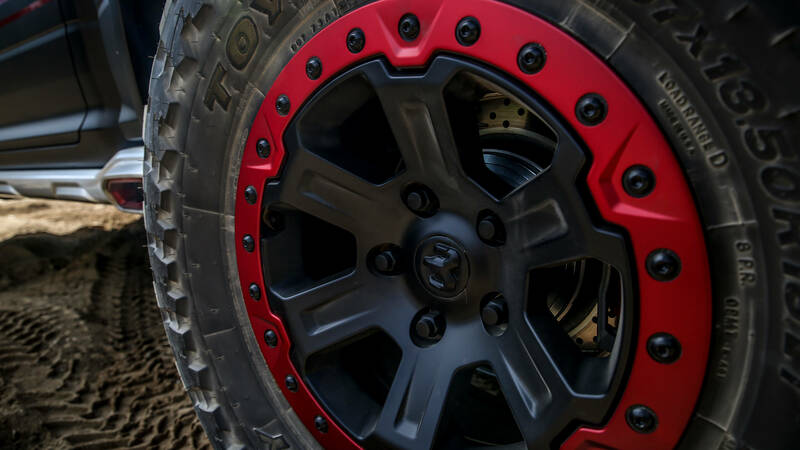 The Rebel TRX will absolutely be a direct competitor to the Raptor, that is if it gets built. And from what we’re seeing, not only could the Rebel TRX be a direct competitor with the Raptor but it could actually be, dare I say, better? First of all the looks. There’s no denying this is a great looking truck. That front end looks very aggressive and the whole stance of the truck is different, in a good way. 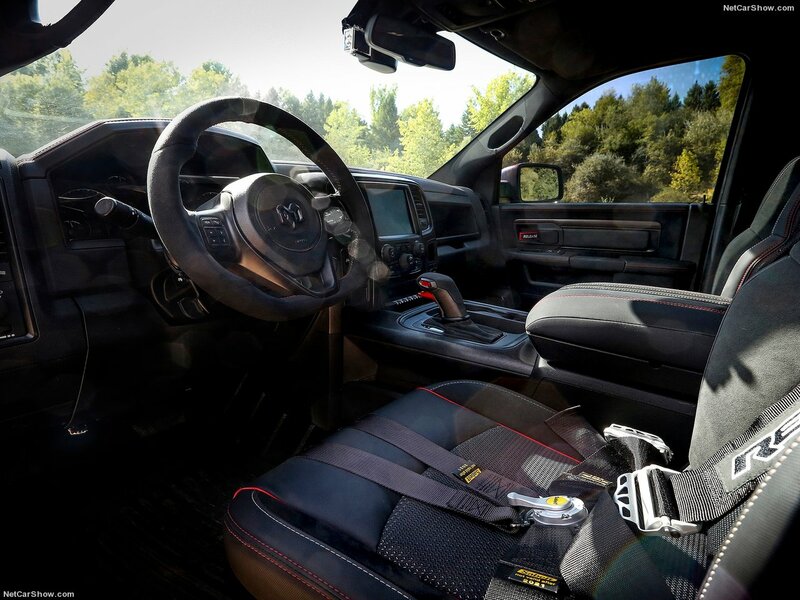 There will be no problem distinguishing the TRX from any other RAM trucks, which as we’ve said before is one of the issues we have with the new second gen Raptor. If you’re going to have the best truck on the market, you want it to look like it right? Instead of looking like every other truck on the road. Now let’s talk about what’s under the hood of this Rebel TRX. Rather than going for a new fuel efficient, environmentally friendly turbo V6 like the Raptor, RAM opted for the fire breathing 6.2L Supercharged V8 that also powers the mighty Hellcat! It doesn’t have the full 707hp, instead, a tuned down version producing 575hp which is still phenomenal, especially compared to the disappointing figures released for the new Raptor at just 450hp. In case math isn’t your best subject that’s 125 more horsepower in the Rebel, plus its a V8 and sounds amazing so it’s already leaps and bounds ahead of the Raptor in our opinion in this department. They even put six point racing seat belts in the truck! It doesn’t stop there either. As we all know the suspension of the Raptor was the main feature that separates it from all other trucks on the market. The Rebel TRX appears to be fully prepared for this challenge as well. I wasn’t able to find the exact size of the shocks (my guess from looking is 3.0s), but I do know they are bypass shocks and to make things even better, they look like they’re King Shocks. King is one of the most respected shock manufacturers in off-road racing so this is a very good thing. 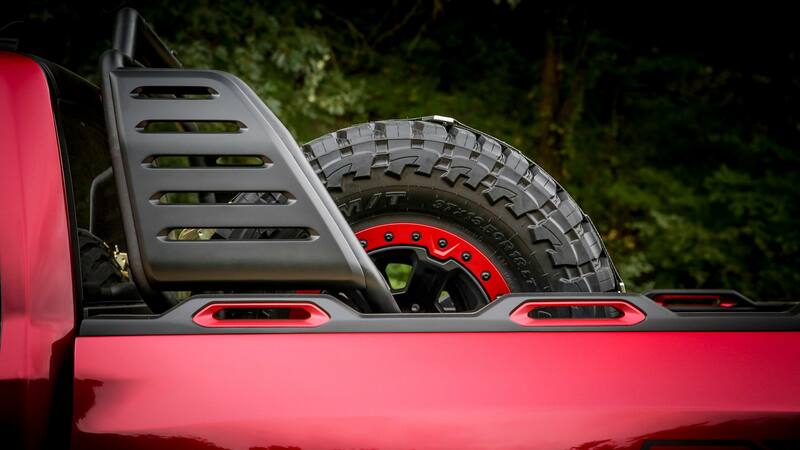 Reports are claiming there will be at least 13 inches of travel which would match the 2017 Raptor. Plus the TRX is set to come with 37-inch tires from the factory where the Raptor only comes with 35’s. 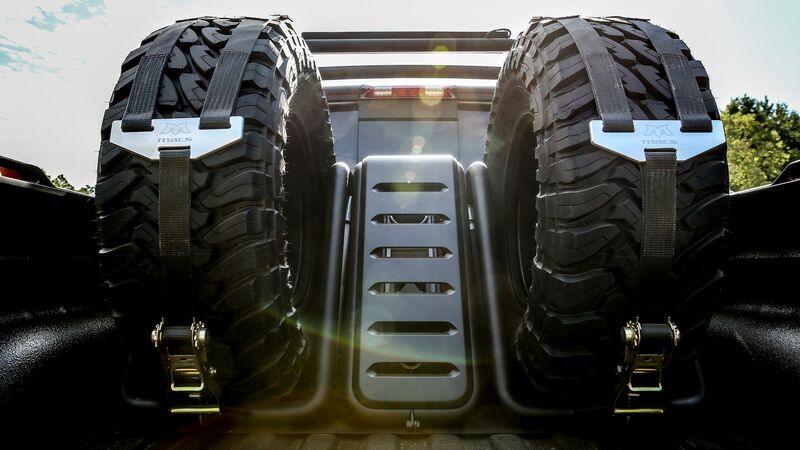 Bead-Locked 37-inch Tires from the factory! Have we mentioned how amazing this thing sounds, with the stock exhaust, especially compared to thefart-can sounding second gen Raptor? Because that’s a big deal to us. There is a lot more to the Rebel TRX that we’re really excited about as well. That tire rack in the back of the bed looks fantastic! 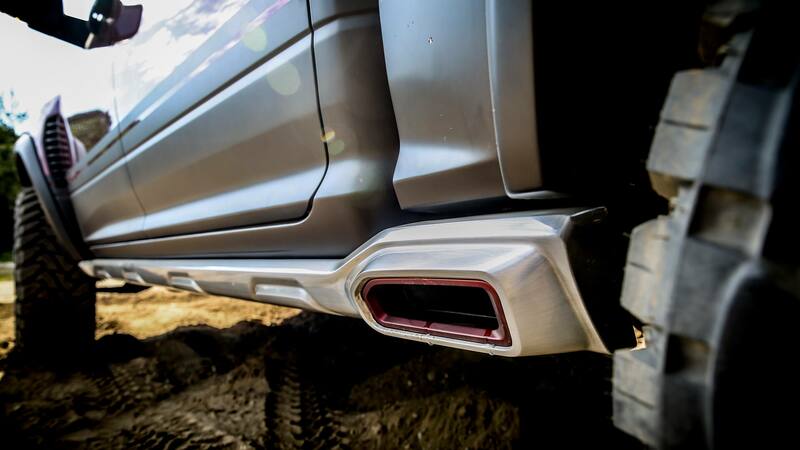 It probably won’t be standard equipment, but none the less it’s good knowing that the truck was designed to have one. It also has terrain mode and is being teased with six-point harnesses. Hell yes! We’re trying not to get our hopes up too much again, because it’s just a concept at this point. But it’s good to know that manufacturers are at least thinking about coming up with a Raptor fighter and we think options in this small market segment can mean nothing but good things all-around. Now all we need is GM to step up to the plate and make something and then we would really have a shootout on our hands. We will continue to find out anything we can about the TRX as more information is released. 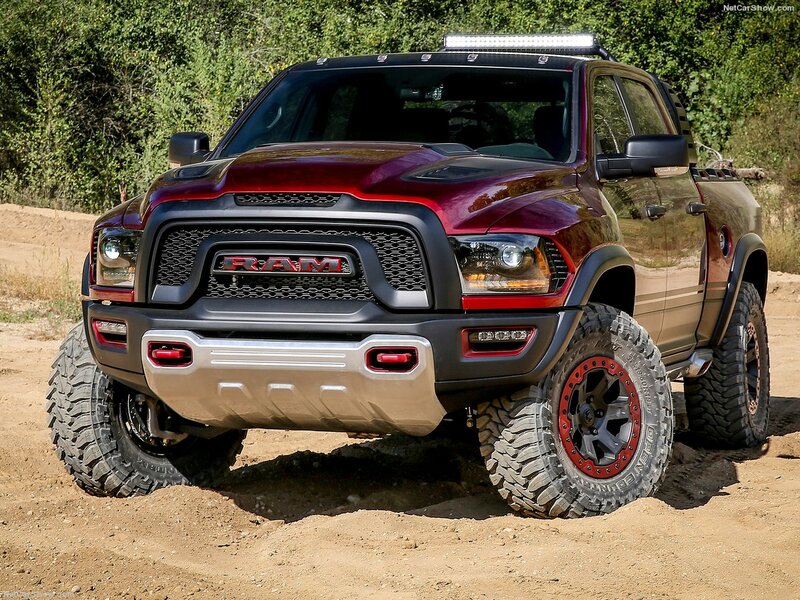 But in the meantime, everyone cross your fingers (and toes) that RAM actually makes a production model of this badass truck.